Tres Dias is an interdenominational Christian three-day ministry. Weekends in communities typically occur two or three times a year and men and women attend separate weekends. Tres Dias was founded in New York in 1972. Then, in 1985 Tres Dias became an international organization when communities were chartered in Korea and Germany. Tres Dias’ global reach now includes Denmark, Peru, Ireland, Canada, Ukraine, and Russia. 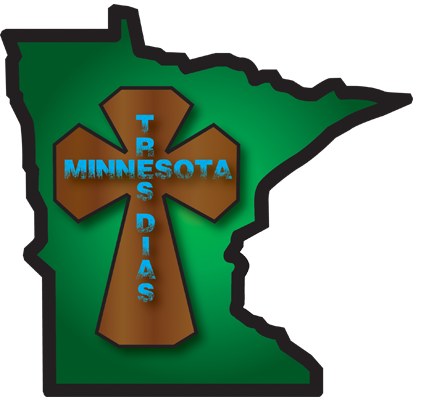 After attending multiple Tres Dias weekends around the world, a group of Minnesotans came together to start a Minnesota Tres Dias over 10 years ago. Since then, over 1000 Christians have attended Minnesota Tres Dias and nearly 100 churches have been represented on the weekends. Not only do community members serve in their home churches, but Tres Dias attendees have gone on to start new ministries, serve overseas and establish new home churches. Our mission is to make famous Jesus Christ through being his hands and feet here on earth. We strive to follow His leading by building leaders who will leave the weekend and sow into a local church as well as serve in other ministries elsewhere. Tres Dias is a Christian ministry that revitalizes Christian men and women in their walk with Christ by encouraging them to impact their home and work environments for Christ and by maintaining their own relationship with Christ through small group sharing. We hope that attendees after attending a Tres Dias weekend return to their home churches with a renewed desire to be a Servant Leader. Each day, you’ll hear a series of instructional and inspirational talks that reveal how God has touched the speaker’s life in a deeply personal way. You’ll learn from their insights, struggles and triumphs as you reflect on your own faith journey. In small group discussions, key points from the talks will open your heart to the reality of God’s grace in your life..